As an educator and as many also uphold, learning is key to our careers and development in the field. I have been learning various things during my teaching career so far: new skills, tools to use, methods and so on, but until I moved to Switzerland four years ago, I had never tried to learn another language. I never had to, because English and Greek was enough for me before. This was a completely wrong perception I had, as learning languages are not only about the place you live, or just asking for something in another language. I have come to understand it is much more than that. When I first came here, I started learning German but then I had to stop, with the excuse (it was true back then) that I was getting more and more work and I had no time. Then, Zug is a very international city, so even when I start to speak German with people, they immediately pick up on my English accent and most of them immediately switch to English. Even when I insist they switch back to German, they keep speaking in English – that is how polite they are! Last year, in the college that I teach twice a week, we had to attend two obligatory courses on pedagogy and methodology…in German. The night before the first course I hardly slept. Why am I doing this? I thought. I will never manage to do it. I will disappoint my director (special thanks to Philipp Hediger, who has believed in me and supported me since day one – we are very lucky to have him, as he has supported our professional development to a great extent) and myself. I can’t speak or write in German and never will. I did attend both courses, and I should say, that neither was a walk in the park – we had homework, which my classmates could do in half an hour – I needed seven or eight hours for the same amount. The course lasted eight hours each time, the other was for three hours at a time – for me, it was not only learning about methodology and pedagogy, I was literally being immersed into the language. I learned a great deal in those three months! I could not believe it. I pressured myself, pushed myself to the limits, had great classmates who would explain to me (in German) when I didn’t understand something and great teachers (another huge thank you to Max Woodtli, my instructor). This year I have decided, along with my sister, to start proper German lessons. Even though we speak quite well now and understand more than we think sometimes, we have started everything from the beginning and we are immensely enjoying it! Our teacher is supporting us every step of the way and is so passionate, we truly expect every lesson to come and learn from her. 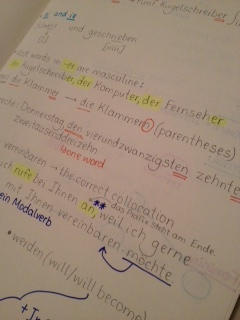 I have decided to step out of my comfort zone in English and tackle German. And you know what? I am also going to restart my Turkish lessons! I feel like my eyes are open and I can see my new home in a different light – I can talk to people, I can write and I can pick up German books in the bookstore and read! Above all, I feel that I can understand my students – how they feel, how they approach learning languages, the challenges they face in English and how they can overcome them. Posted on November 3, 2013 February 15, 2015 by Vicky LorasPosted in 30 Goals, adult learners, education, language, learning, life, special momentsTagged 30 Goals Challenge, education, language, learning, life. I love this post so much. Thanks for sharing your enthusiasm to living learning, I feel this is like a friend whispering “you can do it”. Thank you so much for your wonderful comment, Debbie! Whichever goal you have, just go for it! You have explained in a very good way how the language learners feel when they have to overcome the difficulties. I belive that you will also buy Turkish books to read:). I appreciate your effort. Thank you so much for reading and commenting! I hope that one day I will be speaking and reading in Turkish! Thank you for your positive reinforcement. I really appreciate it! Thank you so much for reading and leaving such a lovely comment! I am so happy to hear you want to learn Spanish and thrilled that you want to start your own blog. It will be super, as you have so much to share, not only from your teaching, but your PhD studies and presentations! I hope you go for it! Yay! I am so sorry I hadn’t realised it – never too late! Going to read it now : ) I would love to write a guest post! Let me know what topic you would like. Thank you ever so much! Your example is strong and empowering. And I hope the moment when I’ll open my eyes is just around the corner! Thanks for the beautiful video. Thanks so much for your comment. Actually, I understand the issue behind motivation – I started German lessons in 2009 when I arrived here, but after work started multiplying, I started to get busier and less motivated, so I stopped. The only German input I got was from my environment (some people do not speak English) and my very good friend Sandra, with whom I try to meet up every week for coffee – she spekas to me only in German. Then I started the two courses I mentioned, but…I needed more and more to learn. I went into bookhops and felt devastated that I could not read anything. So my sister and I decided to start again! It is always better when there is company : ) We motivate and help each other. And we have the most amazing teacher, who moves according to our needs and is simply one of the best teachers I have seen in action! Good luck with anything at all you decide to start, be it a language, a new skill…go for it!